Al Moss, program director of the Respiratory Care Program at Kalamazoo Valley Community College (KVCC), was introduced to IngMar Medical’s Adult/Pediatric Demo Lung over seven years ago. He was quickly sold on the product because of the spontaneous breathing capability, the small footprint, and the portability. As strong advocates of interactive educational technology, KVCC continued to incorporate IngMar’s expanding line of respiratory simulation products into its 35-year-old program. According to Moss, today’s respiratory therapists need to be able to demonstrate competency on low frequency/high risk procedures as well as more common procedures. With 30 years of experience in respiratory therapy, Moss is an advocate of hands-on training using simulation products. 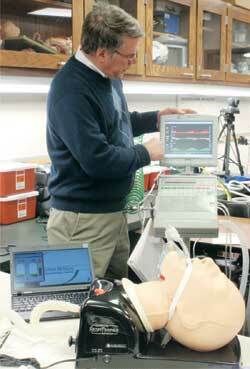 Today, the core of the KVCC Respiratory Program is an intensive ventilator lab. KVCC is using four IngMar products to teach ventilator management – the QuickLung® , the QuickLung with the Breather Option, the RespiTrainer® Advance, and the NeoLung®.The QuickLung Breather system is designed to quickly simulate realistic patient conditions, including several patterns of spontaneous breathing. Moss says it’s his favorite product, “simple, easy and flexible. “With this test lung we can easily change the rate and breathing of a simulated patient to train students,” explains Moss. The instructors create real-time respiratory emergencies, such as pneumothorax or conditions such as ARDS or asthma. According to Moss, the RespiTrainer is a nice product for a training scenario that moves from non-invasive to invasive ventilation. As Moss explains, the students start with non-invasive bag-valve-mask training. Then the training moves to intubation and mechanical ventilation. Throughout the entire process, students get realtime feedback on actual delivered ventilation. For the eight-week neonatal rotation, KVCC uses IngMar Medical’s NeoLung, which can simulate stacked breaths, overdistention, stiff lungs, and leaks. Because of the prevalence of leaks in neonatal ventilation, Moss sees the ability to easily simulate leaks as one of the product’s key benefits. In addition to the benefits of hands-on experience and critical thinking, the biggest benefit of using respiratory simulation products, according to Moss, is consistency. KVCC is already planning to incorporate an additional IngMar Medical product this fall, the ASL 5000 Breathing Simulator. The computer-controlled ASL 5000 is more sophisticated than a mechanical lung and can simulate almost any respiratory patient, including scenarios where the patient’s condition changes over time and in response to changes in ventilator settings. KVCC will be using the ASL 5000 with a Laerdal SimMan, adding spontaneous breathing with realistic chest rise to their human patient simulations.